The way matter behaves in the extremely powerful magnetic fields of dying stars known as white dwarfs has now been mimicked in labs on Earth, researchers say. The advance came via devices made from silicon laced with phosphorus, which is very similar to nearly all computer microchips, "so in some ways we are carrying 'round the secrets of dying stars everyday in phones and computers," study author Ellis Bowyer, a condensed-matter physicist at the University of Surrey in England, told SPACE.com. 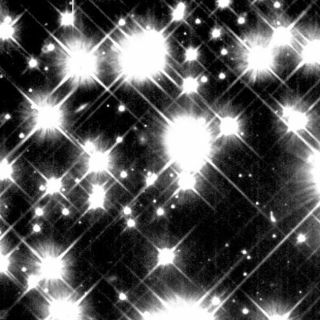 The sun, along with more than 90 percent of all stars in the galaxy, will one day end up as a white dwarf, which is made up of a dim, fading star core. These cooling, dying stars are as common as sunlike stars, and while they are only about the same volume as Earth, they typically pack in about 40 to 90 percent of the mass of the sun. White dwarfs possess powerful magnetic fields far stronger than any on Earth. For instance, the strength of the magnetic field at Earth's surface is only 30 to 60 millionths of a tesla, while the strength of a white dwarf's magnetic field can reach 100,000 tesla. "To put this in context, if a fridge magnet with this field was placed in the middle of a city like New York or London, everyone with a pacemaker would have to leave the city to avoid being affected," Bowyer said. "Fields around 1,000 tesla can be produced in a lab, but these last for fractions of a second and result in the destruction of the equipment." However, there is much dispute about how atoms in such powerful fields behave. Existing theories regarding these fields cannot be tested directly using any magnetic fields scientists can generate on Earth. To learn more about white dwarfs and their incredible magnetic fields, researchers sought to simulate the dying stars in the lab using samples of silicon laced with phosphorus impurities. The atomic properties of phosphorus mimic those of the atomic hydrogen making up the dying stars in certain ways. "We originally started planning these experiments for completely different reasons," Bowyer said. "The majority of us are working on using atoms like phosphorus to form the basis for a quantum computer, a highly anticipated technology that relies on the quantum nature of matter to produce much faster computing power." "We wanted to know how these atoms were affected by magnetic fields in order to find a way of manipulating arrays of these atoms efficiently, when we noticed that at relatively easily obtainable magnetic fields, the electrons in the atoms we were studying would start to behave in totally different ways to usual — they would be dominated by the magnetic field rather than the nucleus they orbit," Bowyer added. Lead study author Ben Murdin at the University of Surrey has a background in astrophysics, and pointed out "that this was exactly the same as what happens in white dwarf stars," Bowyer said. The scientists compared the light emitted from phosphorus atoms under magnetic fields in the laboratory with that seen from the hydrogen atoms in white dwarf stars. They found phosphorus atoms in magnetic fields of tens of tesla behaved much like hydrogen atoms in fields of tens of thousands of tesla. "By applying a 30-tesla field available at several labs around the world, the same physics as in a white dwarf can be reproduced," Bowyer said. "We have managed to recreate some of the most extreme conditions in our galaxy." Future studies can analyze how other materials might behave in white dwarfs, such as helium, which could be mimicked with sulfur or selenium. Such work could lead to discoveries of new kinds of magnetic chemical bonds, the researchers say. The scientists detailed their findings online Feb. 12 in the journal Nature Communications.